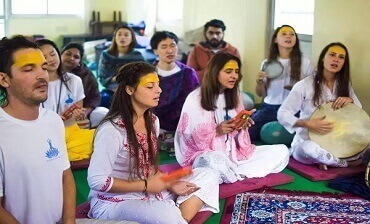 200 Hours Yoga Teacher Training in Rishikesh, India is very popular among the students who chose to be a Yoga Teacher or for personal life transformation. The word yoga originates from the Sanskrit word 'Yuji which means the union of the individual consciousness with the universal consciousness. People choose yoga as their profession, as an exercise for body fitting and healthy life or as a reason for the vacation. More interesting is some may even search yoga with lots of questions in mind. The real learners are those who search for the divinity of yoga. encountering self-finding liberation and changing the destination of their life. The 200 hours Yoga Teacher Training Course offers complete theoretical and practical knowledge of yoga for the students. We provide a hands-on training program that included all the important elements of Yoga such as 45 Asanas. Pranayama. Shat Kriyas, Anatomy, Teaching Methodology, Mantra Chanting, Meditation, Yoga Therapy, Yoga Philosophy, Practicum and Students Ethical Value. Our classes are conducted by or experienced Yoga Instructors in Hatha, Vinyasa, Alignment and lyengar way of Adjustment for students. 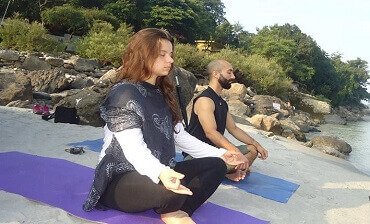 Om Shanti Om Yoga Ashram has designed this course to involve students deeply in the spiritual teaching and practice of traditional Hatha and Ashtanga yoga. breathing techniques, awareness, meditation, and practical philosophy to utilize your body and soul in the world of yoga. The daily class starts from 6.00am to 7.00pm with 3 breaks in between for food and refreshments and self-study. Each day, you should attend all seven or eight classes which comprise in eight to nine hours a day without fail. Attendance is taken seriously in this 25 days course. "You'll come here as a STUDENT and leave as a TEACHER." Classes will be from Mon to Sat, Sundays will be rest days or you will have Yoga Retreats. body massages or some classes. Students will be given one assignment test, one theory test and finally one practical test in order to prepare you to be qualified as a Yoga Teacher in all the areas before awarding Yoga Alliance US certification.